What comes to mind when you think about learning to play piano? Chances are, there are a few images you think of right away. An acoustic piano. Pages of sheet music. A teacher – maybe a nice one, maybe not so nice – standing over you as you hesitantly plunk out some notes on the keys. Maybe even a piano recital, with bright lights shining down as you play a vaguely recognizable tune. In other words, you’re picturing traditional piano lessons when you think about piano for beginners. That’s a pretty good description of my own early piano learning experiences. I, my teacher and her cats spent a LOT of time in her living room as I practiced, practiced, and tried to get out of practicing. My parents believed in the importance of music education, and this is what we all thought it meant to learn beginner piano. If you want to learn to play piano, you’re probably expecting a similar experience. After all, for hundreds of years, people have taken lessons this way. But before you sign up for the typical piano-learning experience, it makes sense to think about what your needs are. Is this approach is right for you? 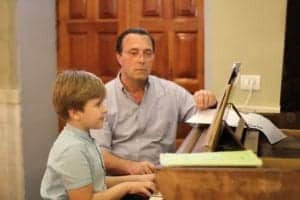 As you already know, traditional beginner piano lessons usually mean studying one-on-one with a music teacher. You can picture the overall experience, but you might be fuzzy on what exactly each lesson will entail. Let’s take a look at what you can expect. Your teacher will most likely show you how to sit at the piano, how far to position yourself from the keys, and emphasize the correct way to hold your hands over the keyboard. Once you’re set up in proper position, it will be time to find middle C and learn some finger exercises. You’ll learn a bunch of sequences of notes, and your teacher will show you how to go up and down along the sequences while moving your fingers correctly. It will feel clumsy at first (okay, not just at first – it will feel clumsy for a long time), but that’s normal! It’s not enough to know the exercises in theory. You have to be able to play them, in practice, in every section of your keyboard. Your teacher will probably recommend that you spend a lot of time playing scales, scales, and more scales. Needless to say, you’ll be spending a lot of time traveling up and down your piano – one set of notes at a time. Once you get good at one set of drills, you’ll be able to move on to more complicated ones. But you’ll still need to return to some basic drills every time you start to practice. This is part of warming up for each lesson. Even if you progress to a more advanced level, you’ll still probably do drills as a way of maintaining your dexterity. An important part of your journey to learn to play piano this way will be sight-reading. In order to play with the traditional approach to piano lessons for beginners, you simply must learn to read music. What does that entail? Well, sheet music is a way of notating very specific sounds, timing, and intervals. That means you’ll need to memorize what each symbol means, and how to play it. You’ll have to learn to associate everything you see on paper with specific notes on your instrument, how long to play them, and at what tempo. At some point you might also learn to add in octaves. Your traditional teacher of pianos for beginners will probably start you out nice and slow with super-simple sheet music. You might start out with “Mary Had a Little Lamb” or some other common tune. Eventually, you’ll get to the point where you are playing with both hands, looking at both treble and bass clef on your sheet music. Practice will involve a lot of focus and probably quite a few mistakes. It takes time to create new connections in your mind between what you see on paper and what you do with your hands! As you progress, you’ll start to notice that it becomes tempting to memorize new songs as you learn them. After all, your hands do eventually get familiar with tunes that you play often. If you’re spending a lot of time playing the same piece over and over again, you’re building up muscle memory. But here’s a word of warning: Far too many people who learn to play piano this way have fallen into the trap of memorizing songs. If you want to develop your ability to sight-read well, you have to avoid too much memorization. You’ll need to work hard to maintain the connection between what you see and what you play. How Long Will it Actually Take to Learn Piano? If you make it to the point where you can read music and play along competently, congratulations will be in order! Most traditional beginner piano students don’t make it past their third year of lessons. Let’s take a look at what they’ll have typically learned in that time. It’s tricky to pin down the exact statistics, but a lot of piano teachers seem to agree that in three years a typical piano student should be able to look at a simple piece of sheet music and play it after practicing it for a while. If you want to easily play intermediate level music, you’ll probably need to study for several more years. Let’s say five years, minimum. Not everyone wants to go beyond that point, because not everyone wants to devote their time to serious classical works. But if you do want to competently play advanced compositions, it could take an average of 10-15 years of consistent study. Keep in mind, all this assumes you are a motivated student! I studied piano for 12 years and never quite got to that point. (I was spending most of my practice time wishing I was somewhere else.) In fact, by the end of 12 years, I could only play 2 songs easily, and that was because I memorized them. Let’s get into some numbers. In the U.S. these days, the average cost of piano lessons is $40 an hour. Assuming you take the minimum recommended number of classes per week (one) and you take a lot of vacations (! ), I think it’s fair to say that you might take about 30 lessons per year. That will cost you $1,200, not including any required materials, the price of gas for transportation, etc. Okay, now keep in mind that this number is for one year only. Let’s say you stick with piano lessons for three years so you can become comfortable with reading simple sheet music and playing simple songs. That will cost you $3,600. For five years of lessons, you might pay $6,000. For 10 years, you can double that. Now we know how much it might cost to learn to play piano the traditional way. There’s got to be a reason why so many people make this investment. It might have something to do with one of the benefits of this approach: in-person training. What are some of the benefits of learning piano from a piano teacher right there with you? For one thing, most piano students are kids. And most kids simply won’t be able to sit down and follow a learning system on their own. In order for them to learn to play the piano at all, someone needs to teach them. If your child is learning, or if you are a young learner, having in-person training could be very important. Even many older learners tend to need help navigating the world of traditional piano. Beyond a few “naturals,” most beginners find music theory and sight-reading to be pretty challenging. If you don’t want to try to puzzle out sheet music and figure everyone out all alone, a traditional teacher could come in handy. Finally, there’s something many of us need when it comes to challenging tasks: accountability. Having a real live person watching you play and giving you assignments might be important. When you feel like giving up rather than practice “Maple Leaf Rag” for item number 100th time, it could be helpful to know that in just a few days your teacher will be expecting to hear how you’ve progressed! Fair enough. But there are also some negative aspects of in-person training to take into consideration. Will you meet your teacher at your house? At theirs? At a school or other venue? There are some important logistics to plan for if you want to learn to play piano the traditional way. If you’re inviting someone into your home every week for years on end, you’d better make sure you keep your piano keyboard in tune, and that your family and neighbors don’t mind the disturbance. If you’ll be going to your teacher’s home for each lesson, you’ll need to have reliable transportation. Make sure you add enough time into your schedule for traveling back and forth. You’ll also need your own piano or keyboard on to practice with at home. Once each lesson starts, you’re going to experience something that I feel is a big potential downside of in-person. What’s the first thing your teacher will ask you to do after warm-ups? Review! Before you can get into any new material, you’ll need to demonstrate what you’ve (hopefully) practiced since last week. That assumes you actually remember it. If not, review might take up a bit more of your time. This seems a bit inefficient to me – who wants to spend the first third of their lesson talking about what they already did or didn’t do? When you finally get to what you’re supposed to be learning, there isn’t much time left for playing songs you like. When I was studying piano, this was really frustrating. If I had any questions during my practice times, I’d get stuck. Then I’d spend a bunch of time in my next lesson just trying to get back up to speed. In my opinion, that’s a big drawback. Is Traditional Piano Learning Right for You? If you want to play this guy’s music, you probably need traditional lessons. Are traditional piano lessons the right choice for you? To find the answer, you have to take a look at your goals. What kind of piano player do you want to be? Do you mostly want to play popular tunes from the latest Billboard charts? Are you a big vintage music fan, waiting to unleash your own renditions of “oldies”? Or are you hoping to serenade your family with Christmas carols during the holidays? Do you like the idea of learning improvisational playing? Or playing piano by ear? If you answered yes, you probably don’t really need traditional lessons. In fact, it would probably take years before you could accomplish your goal that way. Chord-based piano method would be much simpler and more feasible if you’re just getting started. 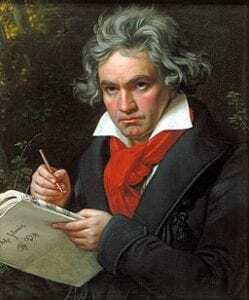 But… are you a big Beethoven fan? Do you dream of the day you can play Chopin at the drop of a hat? Are you hoping to become a professional pianist one day? If so, then traditional lessons just might be the right fit for your needs. You’re going to need extensive sight-reading experience and music theory to achieve your goals. A teacher who helps you learn to play piano the traditional way will be the best choice. Maybe you don’t really aspire to become a classical pianist, but you’re not quite sure that other approaches could help you learn how to play piano. Do you really want to go through years of lessons before you find out? I’d love for you to check out my free 5-day workbook to see if my simpler, faster chord-based approach could be useful to you. Worst comes to worst, you decide that you don’t like what I teach or how I teach it. Fair enough – at least it will only take 5 lessons to figure that out. And if you do find that you enjoy my workbook, online learning with my full 21-day course could be exactly what you need to get playing real songs on your piano keyboard – without years of training and thousands of dollars in lessons. It’s worth a shot!